Rheola, a former gold mining township, is now a village about midway between Dunolly and Wedderburn. Bendigo, 55 km east of Rheola, is the nearest provincial city. 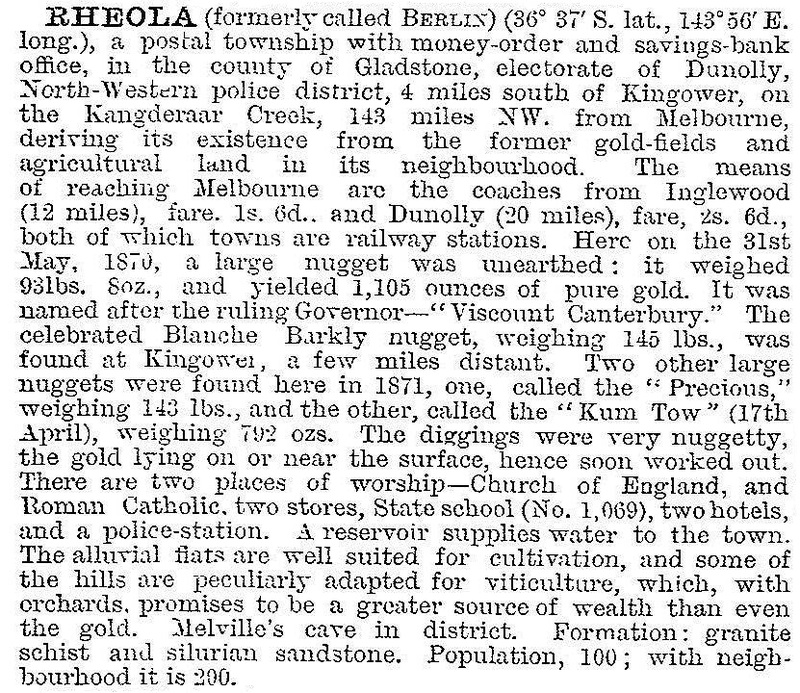 Gold was discovered at Rheola in 1858. The gold field was named Smiths Gully, and renamed Byrr Lynn by the discoverer of a fresh field in 1868. (There are other versions of this name, however). The name in a few years was reduced to Berlin, and in 1876 was changed to Rheola. This final name was apparently adopted following a suggestion by B.J. Davies, MLA for Avoca. There is a Rheola in New South Wales where Davies was born. Within two years of the 1868 discovery Berlin had a primary school and an Anglican church. In 1871 there was a census population of 1714 people and a Catholic church was opened and a progress association formed. Several large nuggets were found, including two weighing over 1000 ounces. There are several other gold towns near Rheola. In addition to Kingower there were McIntyres (southwards), Burkes Flat (west) and Wehla (north-west). North of Rheola is the Kooyoora State park, in which are the Melville caves. They are named after the bushranger ‘Captain Melville’, Frank McCallum. The caves reserve has a camping area and a lookout. Rheola has a Catholic church (1901), a hall, a cemetery, a memorial park, and a scatter of buildings. Regular church services ended in 1956 and the school closed in 1978. Rheola’s annual Easter Monday sports carnival has been held since 1871. It’s a great day for wood chopping and sheep dog trials.